Bad news for all you online gamblers out there. Get ready to say goodbye to convenience, because the U.S. government shut down on Friday the three largest Internet gambling sites that are operating in the United States. Pretty scary… That’s what you get when you allegedly disguised billions of dollars of gambling payments as online store purchases of items such as jewelry, golf balls and flowers according to the Wall Street Journal. This accusation says that the banks that processed payments for these gambling companies were unaware that they were handling gambling funds. It also says that smaller and financially ailing banks were found by these companies and made investments in them. 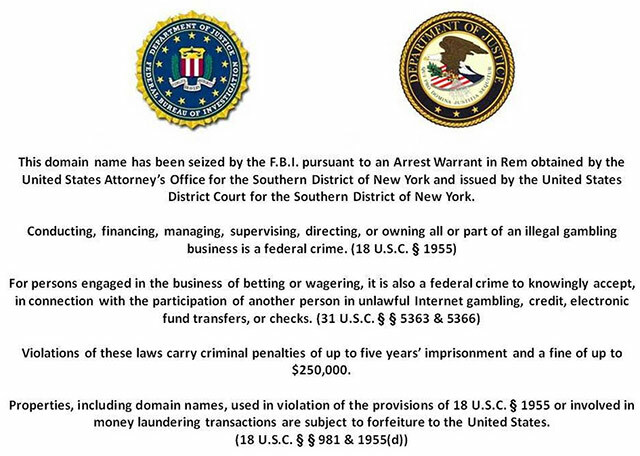 One of the problems of this accusation however that these three online gambling organizations are not based in the US. PokerStars headquarters for example is located on the Isle of Man, which is a self-governed British Crown Dependency found in the Irish Sea between Great Britain and Ireland. So the question now is, should they really comply? There are still conflicts about whether or not gambling is a crime. I want to know what you think. Should online gambling be illegal or not? Personally, I think it should.